2016 VinelandMeet Willa Knox, a woman who stands braced against the vicissitudes of her shattered life and family - and the crumbling house that contains her.1871 VinelandThatcher Greenwood, the new science teacher, is a fervent advocate of the work of Charles Darwin, and he is k... read full description below. 2016 VinelandMeet Willa Knox, a woman who stands braced against the vicissitudes of her shattered life and family - and the crumbling house that contains her.1871 VinelandThatcher Greenwood, the new science teacher, is a fervent advocate of the work of Charles Darwin, and he is keen to communicate his ideas to his students. But those in power in Thatcher's small town have no desire for a new world order. Thatcher and his teachings are not welcome.Both Willa and Thatcher resist the prevailing logic. Both are asked to pay a high price for their courage.A testament to the power and goodness of the human spirit,iUnsheltered explores the foundations we build, crossing time and place to give us all a little more hope in those around us, and a little more faith in ourselves.iUnshelterediis a novel for our troubled times. Barbara Kingsolver is one of the most important voices of our time. Barbara Kingsolver's previous fourteen works of fiction and non-fiction have been translated into dozens of languages and earned a devoted readership. She won the Orange Prize in 2010 for The Lacuna and her novel Flight Behaviour was shortlisted for the Women's Prize for Fiction. In 2000 she was awarded the National Humanities Medal, her country's highest honour for service through the arts. 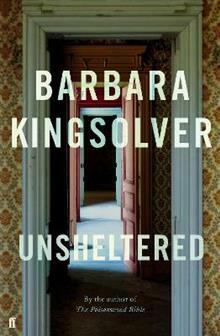 Before she made her living as a writer, Kingsolver earned degrees in biology and worked as a scientist. She now lives with her family on a farm in southern Appalachia.